This page will outline how I propagate my cuttings from dormant grape vine cuttings that I have taken during the winter. Here is a list of supplies you will need to do this at home please check the link page under supplies for places to purchase this equipment from. Heat Mat: The bigger the better on this. Not for heat all should provide this but you will quickly find space running out as you root more and more vines. 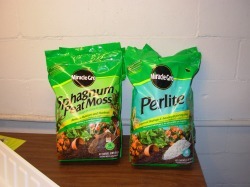 Rooting Media: I use a mix of 3 parts Perlite to 1 part peat moss. other mixtures may be used but the idea is to keep the cuttings moist to prevent dessication and yet still have good drainage. Buy more than you think you may need, especially in the Perlite. Container to root in: I use containers that originally held water plants I had to drill holes in the bottom for drainage but I bought them from a local nursery for like $.10 a piece. The requirements for your container should be the following. It should hold at least 6-8 inches deep of rooting media. Have proper drainage at the bottom. Be black in color. For some reason black hold heat when on the heat mat. The container should be big enough to space your vines about 2 inches apart from one another. 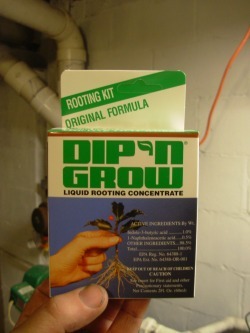 Rooting hormone: I use dip n grow as seen below. It works well, be sure to follow all manufacturers warnings and guidelines. Please wear gloves when using this product. It can be bought right from the manufacturer online. 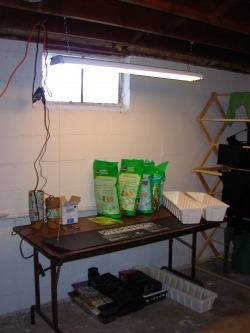 Growing light: You will not need this right away but it is a good idea to start watching the sale ads as you begin to root your grape vines for a long florescent light. You will need this once the plants are rooted and planted in containers unless you live in a part of the country where you can plant immediately outside. 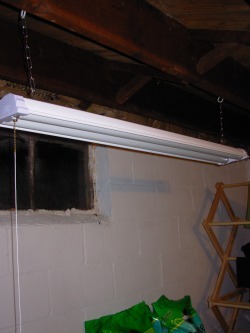 I just purchased a workshop light with a pull chain on off switch. I think I spent under $20.00 for it and bulbs. Misting bottle: This will be used to keep the cuttings hydrated during the rooting. You will use it at most 2-3 times a day. 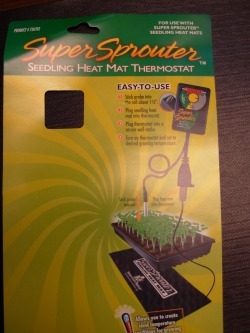 Thermostat for heat mat (optional): I purchased one to save on energy and so that I don't take a risk of baking my cuttings. It has a thermometer that you stick in your containers and it will call for heat or to shut off the heat from your mat as it is needed. 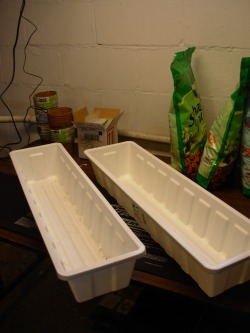 Fridge space: Unless you plan to get or take cuttings and start propagation in the same day you will need to store them in a cool place but yet not freezing. 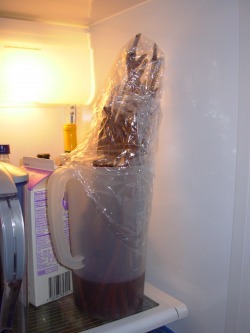 Best solution a refrigerator. A place that can get dirty: You will be watering, filling containers, misting, etc. This will cause some mess. Do not do this in an living room or other livable area unless you are okay with stains and messes. The best location is honestly a basement. Its a cool environment (which you want) it typically has easy to clean floors and access to electricity and water. (do not mix those two though....)heated garages or garages that stay above freezing all year are great too. Basically you want easy to clean floors and if possible a cooler environment. The idea will be to have the rooting end of the vine warm to encourage roots and the upper end cool to discourage growth or bud break. If bud growth begins and there is no root system to support it the plant will eventually wither out and die or be severely stunted. Also you do not want them in direct sunlight this will also encourage upper growth before root growth. Block out a window or use different material to shade your vines as you begin to root them. For me my basement does this naturally. i figured I would start off on how I plan on raising my cuttings into healthy grape vines. Here are the supplies I have lined up for the task. In this picture is the total overview of the operation in the basement of our house. It is not pretty, but it will work great. 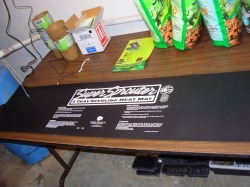 My heat mat was ordered from Botanical.com they had a great deal on this large of a mat. its 12 x 48 and is big enough for 2 trays. I am using trays that are really made as window box liners but because they are deep they are perfect for getting the cuttings down about 6 inches for rooting. These are white and worked okay, but I have better luck with black colored containers. For a rooting media I am using 1 part peat moss to 3 parts perlite. This is avaiable at just about any nursery of chain hardware store. This is the rooting hormone I purchased right from the manufacturer. The folks at Dip n Grow are excellent and will answer all your questions. this little package is enough to do about 1000 cuttings I was told. Be sure to follow all directions and wear a good pair of rubber gloves when using it. And the last piece of hardware is a standard pull chain florescent shop light. Purchased at Menards (chain improvement store) for $15.00. This will be used when the grapes develop roots and actually start to grow until then it sits and waits. Cuttings should be taken from healthy disease free vines. They should also be taken when the vine is dormant, for me I normally do this in December or January. (no leaves should be on the vine when cuttings are taken otherwise you are taking "green cuttings" and this is a whole other process of rooting.) You want to take the cuttings from new wood that grew the previous season. Do not use the mature wood of the vine. You want a cutting that is about the same thickness as a pencil, with at least 4 buds. The buds should be close together. So that the total cutting is 10-12 inches long. Be sure to have a good SHARP pair of pruners. You will want a clean fast cut. make your first cut an angled cut about 1/2" above the top bud. The angled cut will help identify "up" when you go to place them in the rooting media. make your second cut perpendicular to the vine about 1 inch below the bottom bud. You will trim this a little closer when you go to place this in the rooting media. I personally cut it a little long to help prevent dessication of the vine. Once you have all your cuttings taken time is of the essence. You want to get them in the rooting media or cold storage as soon as they are cut. For most of us cold storage will be where the cuttings will be places. I bundle my cuttings in 25-30 or less with a couple rubber bands. and then wrap them in 2 layers of damp paper towel then in a double layer of clean plastic wrap then a large bag. You may also use damp sawdust to pack them in, or damp newspaper to wrap them in. I even heard of people using damp paper shredder cuttings to pack the vines in. The main goal is to keep the vines moist and damp and prevent that moisture from escaping. DO not submerge your vines underwater the idea is to keep them moist not drowned them. After you have them wrapped and in their protective coverings. Place them in the upper part of the fridge. try to avoid the lower because sometimes it gets cold enough to freeze the cuttings. some freezing will not hurt however prolonged freezing can injure the cuttings. Keep them in the fridge until you are ready to root them. they can stay in this state for up to a year. Well I am preparing to root the dormant Concord vines. I have taken them out of there plastic and damp paper towel lining and placed them in about 2 inches of water to rehydrate if needed. Tomorrow after work I will be placing them in the trays filled with the perlite/moss mixture. They will soak here in the fridge for no more than about 12 hours. These are some of the grape vines I propagated from cuttings. They are all pretty healthy but I need to get them into the ground I think the roots have no wear to go.